Mrs. Sillwood was fined 5s on Wednesday 8th November 1916 for `aiding and abetting Australian soldier Frederick W. Maddeford to contravene the provisions of the Central Control Board (liquor traffic).' In other words indirectly supplying ale to persons not present in the house and not paying for such themselves. Original building was erected as a toll house for the bridge. Full licence for the TOLL-BAR HOUSE granted at the sessions of **7th September 1847, at the application of Mr. Bullard. 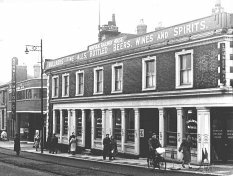 The application had been opposed on the grounds that it was too near the RAILWAY TAVERN opposite. Purchased by Richard Bullard from Norwich Corporation for £430 on 13th January 1851. Also found as the RAILWAY HOUSE. Advertised in 1938 as the most modern and up-to-date licensed house in Norwich. Harry Proctor was an ex-trainer of Norwich City F.C. Closed in late 1973 for refurbishment. Reopened as the COMPLEAT ANGLER March 1st 1974. See page 60 of `Norwich in Old Postcards'.